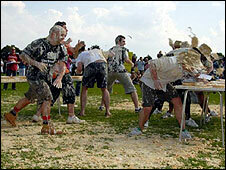 The 41st world custard pie throwing championships has been held in Kent. Competitors in Maidstone were given points for hitting each other with out-of-date pies, with the best scores reserved for headshots. The championships were started in 1967 by councillor Mike Fitzgerald to help raise funds to build a village hall in Coxheath. The idea for the charity event came from a Charlie Chaplin comedy, Behind The Screen. Mr Fitzgerald said: "It's important to be a part of this great cultural event to Maidstone - people will once again get the chance to witness the art and tradition of custard pie throwing! "Last year we had news coverage and TV coverage from as far away as Japan, China and the USA to mention but a few." Contestants competed for the trophy in teams of four. Dave Naghi, who is one of the organisers, explained that two teams of four, with 10 pies each, fought it out until they have no pies left. The pies do not in fact contain custard but are made to a secret recipe by Richard Hearn, from Tovil in Kent, who is the contest's Mr Pastry. The national skipping championship and the Kent Welly Throwing Championship also ran alongside the pie event on Sunday.